Bhaswati, Welcome to the west. I clicked through your link and love this musical sound of Punjabi (right), having enjoyed that sound when I visited Punjab in 1975. However, i don’t understand a word of it. I hope you will share some more of your cultural background so that we English speakers can understand more. Hi, Jerry, thanks for your observations on the post. Interesting to know that you’ve actually been to Punjab! I would love to learn more about your experiences. 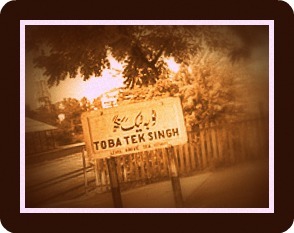 The video I posted is an oral rendition of Saadat Hasan Manto’s famous short story, “Toba Tek Singh”. The link preceding it (“Manto”, hyperlinked) is an English translation of the same story. The original story is in Urdu, the language Manto wrote in. Here’s another translation, should you be interested: http://www.columbia.edu/itc/mealac/pritchett/00urdu/tobateksingh/translation.html? I returned to blogs after a long time and read your immigrant’s postcards and some other stories that I had missed. Anyway, as usual I liked your postcards for two reasons: 1-You have an observant eye….eye for detail. 2- You write in an a very engaging way. Anyway, I have a proposal for you. Perhaps, you may be aware that the Telegraph is coming out from Patna also. It has its Bihar edition now. We bring out a special supplement on Chhath festival that is very popular in this part of India. I believe that many NRIs/NRBs might be celebrating Chhath in U.S and Canada too. It will be nice if you make up your mind to write a piece on Chhath celebration in Canada/ US. We will use it. You still have ample time. I will tell you the date of submitting your story if you agree to write for us on Chhath. You are welcom if you write me on my e-mail. I am so glad to see your comment to my post. I highly value your writing and journalistic sense. Thanks for your proposal; I will be more than happy to take it up. Will also email you. Bhaswati, if ever you have the opportunity, you must see our theatrical production of his short stories based on partition “SIYAAH HAASHIYE” . Enjoyed reading your blog. Thank you Nivedita. Esperanto ! Vinay, thank you so much for reading and taking the time to comment. The production you mention sounds too interesting to miss. Can you please come to Toronto sometime? manto has finally been given Pakistan’s highest civilian honour Nishan e Imtiaz posthumously. It came a little too late, one would think, Rahul, considering the ignominy he had to undergo in his lifetime. Even so, it’s good to see a writer of his stature and significance getting this recognition at last.